Paul Evans is a Royal Society Wolfson Fellow & Distinguished Professor of Applied Imaging Science and Head of the Imaging Science Group. 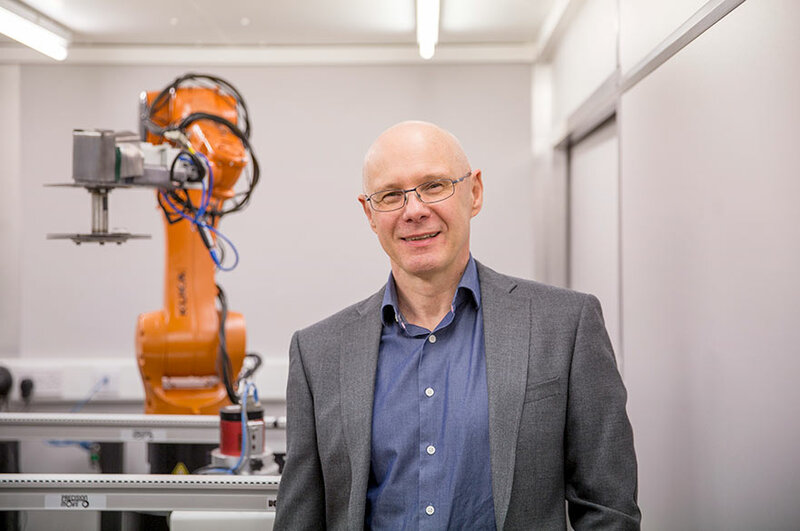 He is the Prime and Principal Investigator for a $5 million programme of research to develop 3D material specific X-ray scanners. This work combines the two primary but discrete fields that evolved and developed disparately from the discovery of X-rays i.e. radiography and crystallography. Professor Evans is a Chartered Engineer, CEng and a Fellow of The Institution of Engineering and Technology, FIET. He is founder and CTO of HALO X-ray Technologies Ltd. Winner of the Institute of Physics (IOP) Dennis Gabor Medal and Prize for the industrial application of physics (2017). Winner of the Times Higher Education THE Prize for Outstanding contribution to innovation and technology (2016). Professor Evans’ research group spearheaded the Queen’s Anniversary Prize awarded to NTU for world class research, “Safety and Security of Citizens” (2015). Employing three interrelated techniques; Kinetic Depth Effect or KDEX Imaging, Laminography and Binocular Stereoscopic Imaging. A major advance is the production of dynamic imagery from a single X-ray source and a static arrangement of linear X-ray sensors. The image capture time is the same as conventional 2D X-ray systems. This work is in collaboration with the UK Home Office Science and Technology Group. This work was originally funded under the Innovative Research Call (IRC) part of the UK CONTEST strategy in partnership with the DHS. Ongoing work is funded by the Department of Homeland Security, Science and Technology Directorate, Homeland Security Advanced Research Projects Agency, Explosives Division through the Advanced X-ray Material Discrimination Program; contract HSHQDC-15-C-B0036. Novel techniques for the identification of materials employing coherently scattered X-rays are currently under investigation and development. This project is funded under the Innovative Research Call in Explosives and Weapons Detection (2007), a cross-government programme sponsored by Home Office Scientific Development Branch (HOSDB); Department for Transport (DfT); Centre for the Protection of National Infrastructure (CPNI); and Metropolitan Police Service (MPS). The synthesis of intermediary view X-ray images from a sequence of sensor views is under investigation. This work is in collaboration with the UK Home Office Science and Technology Group and the US Department of Homeland Security. The programme is funded by the EPSRC. A new type of materials discriminating sensor, which reduces the total number of scintillation elements by 50%, has been developed. The resultant imaging performance is comparable to conventional dual-energy sensors and has formed the basis for a commercial product. This work was funded by the EPSRC and undertaken in collaboration with the UK Home Office Science and Technology Group. A range of image processing techniques utilising basis materials decomposition (BMD) for improved materials discrimination is under investigation. This work is in collaboration with the UK Home Office Science and Technology Group and was originally funded by the EPSRC. This research is funded by the Science and Technology Directorate within the USA Dept of Homeland Security and is in collaboration with the UK Home Office Science and Technology Group. Our work seeks to evaluate the contributions of depth information to the detection and identification of objects in X-ray scans of luggage. J.P.O. Evans; HALO X-ray Imaging; Department of Homeland Security, Science and Technology Directorate, Homeland Security Advanced Research Projects Agency, Explosives Division through the Advanced X-ray Material Discrimination Program; contract HSHQDC-15-C-B0036 (2015-ongoing) $5 million. K. Rogers (Cranfield U); J.P.O. Evans (NTU); I. Lyburn (NHS); M. D. Wilson (STFC): Grant title: PICUP - Point-of-Care Fracture Prediction (EP/R024316/1); Collaborators: HALO X-ray Technologies Ltd; EPSRC; (2018-20); £776k (£229k to NTU). J.P.O. Evans; ACID - Accelerated Contraband Identification by Diffraction (ACID); STFC CLASP (2016-2017) £108k. K Rogers (Cranfield U); J.P.O. Evans (NTU); N. Stone (Exeter U); R. M Martin (Bristol U); P. Zioupos (Cranfield U); Grant title: Point-of-Care High Accuracy Fracture Risk Prediction (EP/K020196/1); Collaborators: HALO X-ray Technologies Ltd; Radius Diagnostics Ltd; EPSRC; (2013-16); £776k (£302k to NTU). S. Godber (HALO X-ray Technologies Ltd); J.P.O. Evans (NTU); K Rogers (Cranfield U) ; HALO Tunable X-ray Technology - High Speed Materials ID (TSB 131257); Tech. Inspired CRD (Fast track) – Electron., sensors & photonics; TSB; (2013-14); £150k. J.P.O. Evans; HALO Tomography, Innovative Research Call in Explosives & Weapons Detection, Home Office Explosives & Weapons Detection Programme part of the UK CONTEST strategy; Home Office Scientific Development Branch (HOSDB), Dept for Transport (DfT), Centre for the Protection of National Infrastructure (CPNI), Metropolitan Police Service (MPS), US Dept of Homeland Security (DHS); (2011-14); £400k. J.P.O. Evans; HotSpot X-ray Diffraction Imaging for Materials ID Innovative Research Call in Explosives & Weapons Detection, Home Office Explosives & Weapons Detection Programme part of the UK CONTEST strategy; Home Office Scientific Development Branch (HOSDB), Dept for Transport (DfT), Centre for the Protection of National Infrastructure (CPNI), Metropolitan Police Service (MPS); (2008–11); £452k. J.P.O. Evans; Grant title: Dynamic Stereoscopic X-ray Acquisition System; Home Office Science & Technology Group (funded via the DETR); (2000 to 2002); £62k. J.P.O. Evans; Introduction of motion parallax into line-scan X-ray images; Home Office Science & Technology Group; (2000); £45k. J.P.O. Evans; Integrated Stereoscopic X-ray Camera (GR/N08858/01) (assessed overall as Outstanding); Collaborator: Home Office, e2v Technologies plc, Image Scan Holdings plc; EPSRC; (2000-2002); £50k. Opportunities to carry out postgraduate research towards an MPhil / PhD or MSc by research exist in all the areas identified above. Further information may be obtained from the Doctoral School.